According to the WIMM MicroApp Guidelines, an ideal micro-app has three key characteristics. First, it should give you information at a glance or with a very minimum of touches. The interaction will typically be less than 15 seconds. Second, it should connect to the Internet infrequently and for short durations. Third, the information it gives you should be immediately actionable. 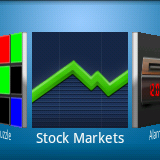 So if you're looking for a textbook ideal micro-app, look no further than MobiSoftApps' Stock Market Indices. 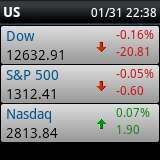 Tap right into it to see the US indices. The Dow and S&P had mild downer days, while the Nasdaq made everyone proud with a nearly unmeasurable uptick! Swipe right to left to get the European indices. Notice how quickly you can get a snapshot of world markets. Also notice that at the top right, it shows you when the indices were last updated. 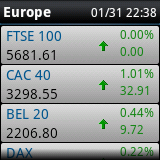 Europe has a few more indices to keep track of. Just scroll down through the list. Swipe right to left again to get the Asian indices. My stock trader friends tell me that the previous day's Asian index movements can be a pretty good indication of impending bloodshed on Wall Street. So this gets to immediately actionable. 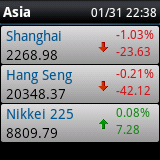 According to this way of thinking, if Asia tanks, you might have a buying opportunity by afternoon! Right? Todd, the developer, says that he plans to add individual ticker symbols when customer can manage them as settings on WIMMs website. Text input is a challenge on these small devices. Having taken my own stab at it, I think the WIMM guys are right that it's a bit of a stretch to enter text on the device. 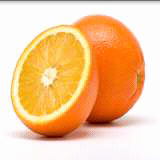 I give this app 5 Ms, my highest rating. I look forward to seeing how Todd adds custom ticker symbols. Was just checking out the WIMM.com website tonight and noticed that the WIMM One is now available from Amazon.com for $199. 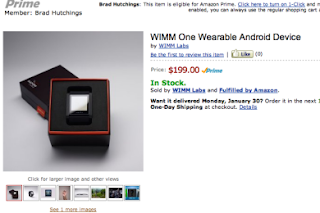 If you shop at Amazon, head over there and give this thing a nice, thoughtful 5-star review. This really made my day. What an unbelievably great price for this kit! James Edmonds' TIPP Calculator is a convenient little app for calculating restaurant bill tips and splitting the bill. Here's how it works. 1. Tap the "Bill" button (left), then adjust the bill using the "+" and "–" buttons. 2. Tap the "Tip" button (center), then adjust the tip amount using the "+" and "–" buttons. 3. To split the bill, tap the "Split" button and adjust the number of people chipping in with the "+" and "–" buttons. This is a super simple app to use, a perfect tool for use on a watch, and gets the job done quickly. Swipe a screen over, and there appears to be a bar tab calculator under construction. You can get in touch with the developer, James Edmonds at support@3kinds.com. I give this app 5 Ms, my highest rating. This is a very nice micro-app.